For nearly 200 years the Boom family has produced hand-made Dutch household items including traditional wooden clogs, brushes and ropes in Alkmaar, the Netherlands, the cheese capital of the world. Situated in the old historic quarter of Alkmaar, the shop presents the timeless products and touch of old-fashioned personal service with the shop being ran by the Boom family themselves. The shop’s location in the heart of one of the Netherland’s most iconic tourist destinations has put this family business on the world map with tourists from Europe and Asia visiting the store to purchase the traditional Dutch handicrafts. The family, third generation owners, approached us looking for help with the implementation of a new ready-to-go theme on their Magento 2 Open Source store. Although we mostly work on full projects where we handle analysis, design, development, testing and post-launch services, it was both refreshing and challenging to take on a project different in scope. After a thorough analysis of the client’s web requirements, our certified senior frontend developer was provided with the initial set of layouts that included 3 desktop stages which were a starting point – home page, category and product page. The fact that we were able to work directly with the owner that is also happened to be a developer made everyone’s life easier. For that matter, all the technical issues during the implementation, were discussed and fixed in the express time without breaking much sweat to explain the importance of everything needed to be top notch in order to be interactive, work and look good. We’ve planned and created CMS content, checkout, cart and the rest of the site in the Magento 2 way, with responsive on our mind. 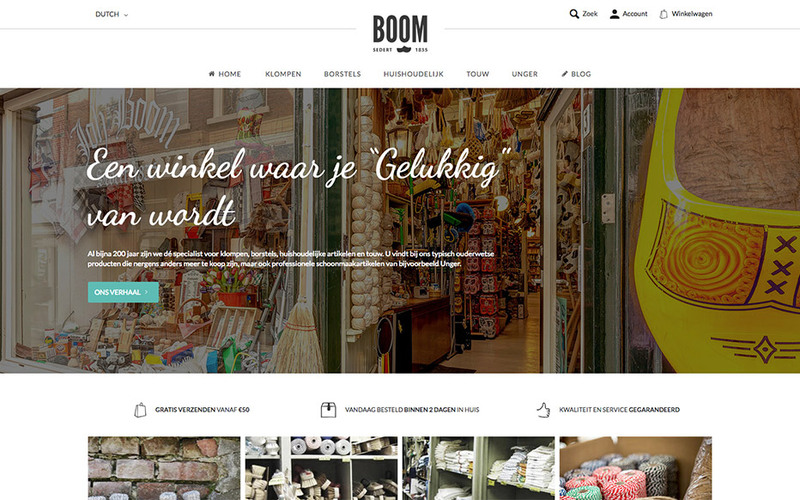 The result is a fluid Magento 2 site with a few custom features, including parallax scroll, promotional elements implemented through widgets and banners that are telling the 200 year old story of the Boom family and their products in this unforgettable shop that puts a smile on your face. The suggestions from Inchoo’s sales and developer representatives were very helpful. The team’s insightful ideas and flair created a final implementation that is significantly more interactive than the original design.